These toy vehicles by London designer Oscar Diaz are assembled from their own packaging. 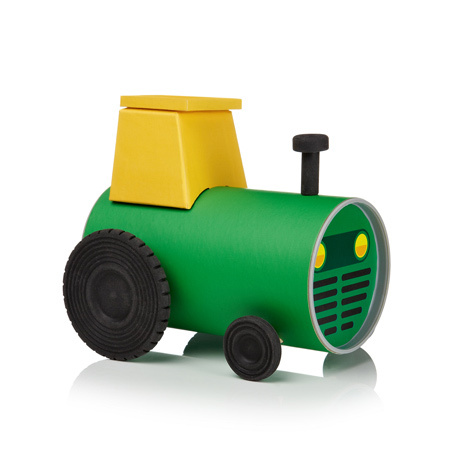 Each Tube Toy comes with components like stickers and wheels inside a cardboard tube that becomes the body of the car, fire engine, train or tractor, with pre-cut slots for easy assembly. Only the paper strip round the outside is discarded and all components are recycled or recyclable. Gift company NPW presented the products at New York International Gift Fair earlier this month, alongside temporary tattoo finger puppets by Héctor Serrano. Other projects by Diaz on Dezeen include a calendar that uses the capillary action of ink spreading across paper to display the date and pens that record sound on paper then play it back - see all our stories about his work here. See more stories about toys here. The Tube Toys are a series of vehicles to assemble were the packaging is also a part of the product, reducing considerably the amount of material discarded after buying it, and the extra cost that traditional packaging involves. All the parts needed to build each vehicle are contained on a standard cardboard tube, which doubles as the packaging. The tubes have slots and holes to place the wheel axes and other components. A single stripe of paper displaying all the information necessaries for the shop (brand, product name/description and barcode) is the only bit that will be discarded after purchase. All the materials used on the product are also recycled and/or recyclable. The cars are easy to assemble and acknowledge the fact that children often enjoy playing with the packaging as much as they do with the actual toys. Gift brand NPW presented the 'Tube Toys' at New York International Gift Fair earlier this month.